I’m super keen to start taking my children to places that are not only beautiful and interesting, but where they can also learn more about the different cultures around the world. I, like you probably, have not taken my children to Morocco but it’s somewhere I’d love to visit. Seeing as we are in the same boat, I figured we would be asking similar questions about visiting the country. By the end of this post I’m hoping we will all know whether you should take your kids to Morocco or not. Often it’s the unknown that makes us apprehensive about travelling, especially when we are planning family holidays. Seeing as I have been looking online for information about how to get to Morocco and where to stay with children, it seemed like a great idea to put all this down in one place so you don’t have to go searching around the internet for Morocco travel advice. Once we get to the end of this travel post, we will both know more about travelling to Morocco with kids. One of the biggest reasons to pick a Morocco family holiday is because it’s so accessible from the UK and North America. Flights to Morocco take around 3 and a half hours to fly from London and 4 hours from Manchester. With airlines like Ryan Air and Easy Jet all providing regular flights to Morocco it’s easy to pick up cheap tickets for the whole family. If you prefer to fly with British Airways they also provide regular flights to the country. 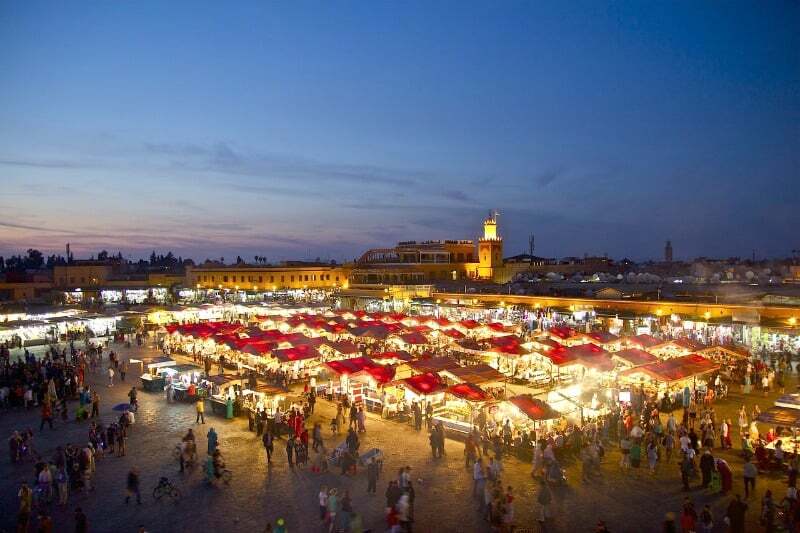 There are a number of airports in Morocco, but the most popular for family holidays are Casablanca Mohamed V. airport, Marrakech Menara airport, Agadir airport, Fes-Saïss airport, Rabat airport and Essaouira airport. 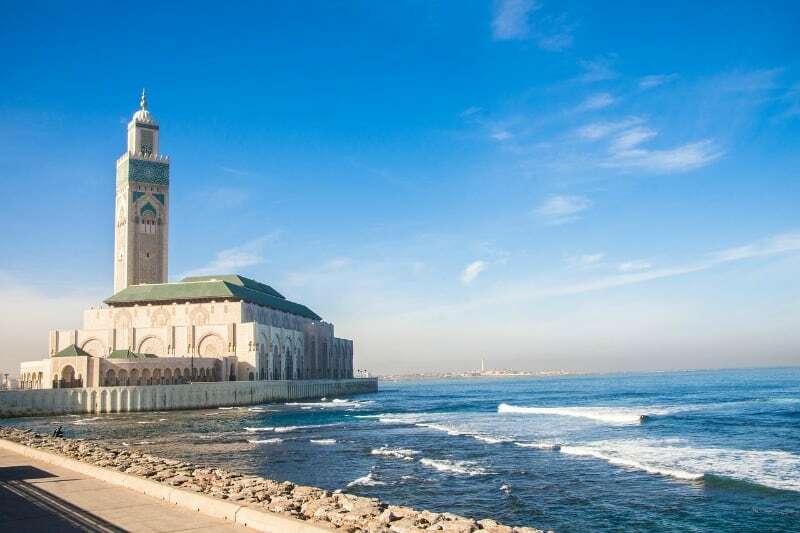 To help you pick which airport to fly to choose Casablanca’s Mohammed V International Airport (CMN) if you’re planning a visit to the beach resorts of the north. If you are keen to explore the High Atlas region Menara airport (RAK) in Marrakech is best. Agadir, Fes, Rabat and Essaouira are all smaller airports but worth considering if you’re searching for cheap deals. What is Public Transport Like in Morocco? One of my biggest concerns about travelling with kids to Morocco is finding out what the best way to get around while you are there is. If I was taking older children to Morocco I would consider using the train. The train service in north Morocco is good and there are discount cards available for families too. I have discovered that road safety in Morocco isn’t the best and buses can be crowded and uncomfortable if you are travelling with younger children. I would probably give this a miss if I’m honest. I would certainly consider hiring a car in Morocco for traveling with kids as there are lots of beautiful landscapes to explore. I get a sense that if you drive carefully and avoid driving at night, that hiring a car in Morocco is the most sensible idea. It also means you can set your own agenda and plan your activities to manage your kids energy levels while on holiday. If you need a car seat though, it’s probably best to take one with you. Before starting to wonder about taking the kids to Morocco I wasn’t really sure that the culture there really lent itself to a family holiday. I’m pleased to say that I couldn’t be more wrong. 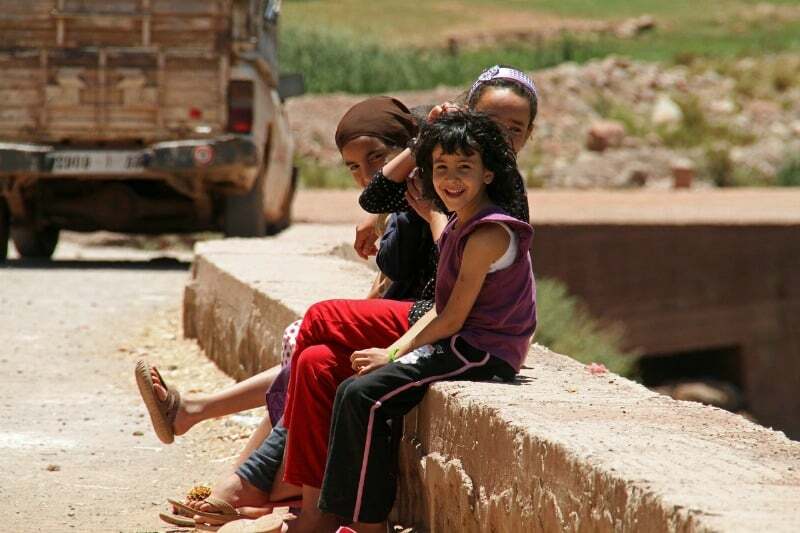 Moroccans adore children and their culture is very family friendly. I for one am keen to educate my children about Islamic cultures and for them not to grow up believing the media stereotypes they are exposed to in our own media. Morocco seems like a country that dispels a lot of myths about what Muslim countries are like. It’s always a good idea to respect the local customs and bearing these issues in mind will obviously make any family trip to Morocco go more smoothly. Public displays of affection aren’t the norm, but who has time when your corralling children to their next destination. Unfortunately homosexuality is a criminal offence so this would be something for LBGT families to consider. If you are not married to your partner, there is also a possibility that you might be asked to stay in separate hotel rooms. It’s also a good idea for women to cover arms, legs and chests while travelling in Morocco. What is the Food Like in Morocco? One of the biggest draws for me for visiting any country is to get to try the local cuisine. I love the idea of trying an authentic Moroccan tagine, but I’m also mindful that the kids might not be so keen. 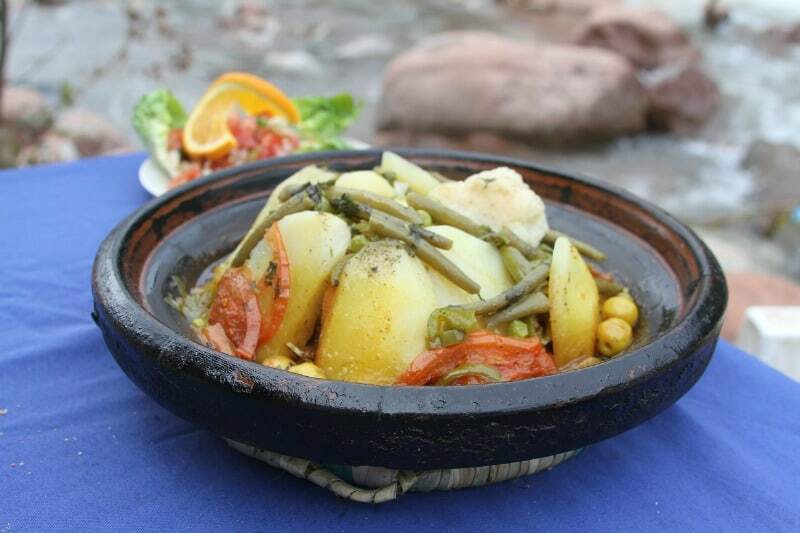 Moroccon food does have some familiar elements like carrots, potatoes and bread, which to be honest my kids love. If trying the local food doesn’t go so well it’s good to know that food like pasta, pizza and fries are also available. If your children prefer familiar foods, it could be worth packing their favourite snacks to take with you on the trip. My kids eat so many snacks that we would probably do this anyway. That brings me nicely onto the topic of health and hygiene while travelling in Morocco with kids. Getting upset tummies is a genuine concern of all of ours when it comes to visiting a place like Morocco, but there are lots of ways to minimise the risk. Generally speaking it’s best to stick to eating hot foods like tagines or cous cous and avoid cold salads. If you buy fresh food from local markets then make sure you wash it well and peel it before eating it. Stick to drinking bottled water and avoid ice. I know that when I’m travelling with kids I always pack hand sanitiser and plenty of wipes, and these will also be super handy for visiting a place like Morocco. A well stocked first aid kit would also be high on my priority list with extra supplies of tummy medicine and rehydration tablets should anyone get sick. The other area I feel I would want to be well prepared with is sun protection. Everyone in our family needs the highest factor possible when it comes to sun cream. Extra sun hats and glasses seem like a good idea for visiting Morocco too. I can also see that having a conversation with the kids about staying away from local dogs and mammals might be helpful. 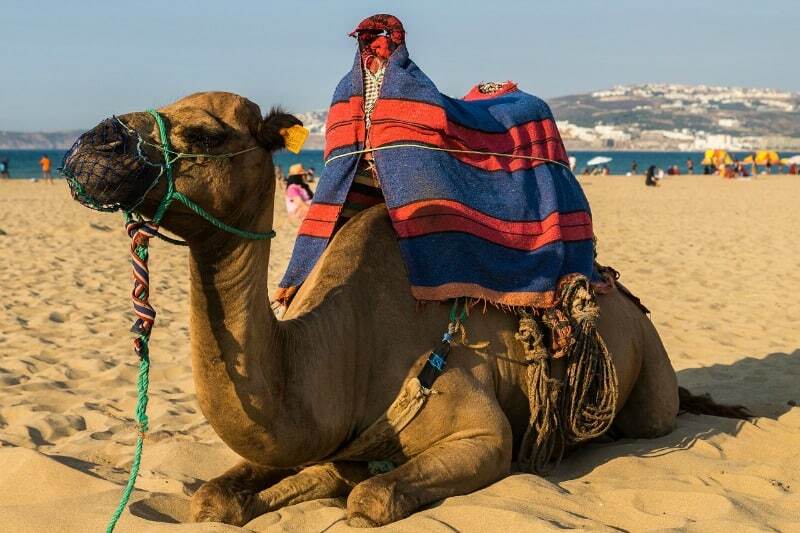 Unfortunately there is a higher risk of them carrying disease in Morocco but if you are going on a camel ride on the beach or see donkey’s in the souqs, these will probably be fine. My children are really curious about animals, so we would have to pay a little more care with this. It’s also a good time to mention that you should always go on holiday with good travel insurance, but making sure that it’s robust enough to deal with the worst case scenario would give me real piece of mind when travelling to Morocco with kids. 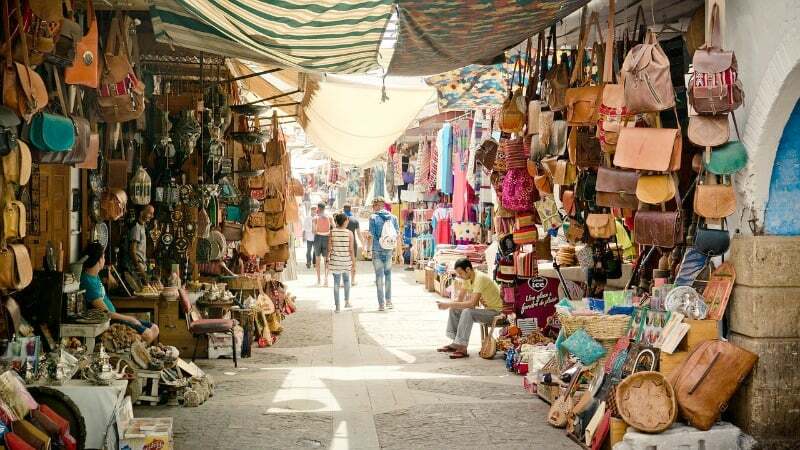 This all boils down to the type of traveller you are I guess, but if you are particularly interested in a Morocco family holiday rest assured there are a lot of them. I did a quick search on Expedia for Morocco holidays and I was pretty impressed with what I found. There are incredible waterparks and plenty of familiar named hotels to choose from. For our family holiday I already know that we like to go out and explore in the day, but when the kids are tired it’s nice to come back to a resort and relax by the pool and take things easy. Having a swimming pool or waterpark ticks so many boxes, and half board hotels work well for us too. We like to have the option of trying the local food, but the convenience of eating at the hotel works well with kids too, especially for breakfast and dinner. Tangier in north Morocco seems like a great option for families looking for a family friendly beach holiday in Morocco. Agadir also has a great selection of hotels, including El Pueblo Tamlelt, and a wonderful shore line too. Of the two locations I think I’m more drawn to Agadir as it’s an accessible distance from Marrakech and I would love to visit for at least a day trip. Marrakech does have family friendly resorts also, but you will need to consider if you are happy without having a beach nearby. I know there will be lots of you who are keen to have a more authentic experience while visiting Morocco and you might want to stay at a Riad or villa. Riads, just by design, can be noisy for families but they are also very budget friendly. If Marrakech was your preferred location, a Riad could be a good choice, but I would spend some time reading reviews by families who have stayed there before booking. After thinking about how to get there and deciding where to stay, it’s time to start planning all the things to do in Morocco with kids. There are lots of experiences that families can enjoy in Morocco to help them appreciate the interesting landscape and stimulating culture so here’s a few ideas to get you started. Enjoy a mountain walk in High Atlas with a local guide. If you are visiting Marrakech with kids a Calèche (horse-drawn carriage) is a really fun way to explore the city. So what do you think? 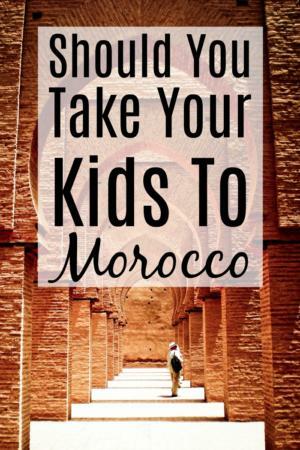 Should you take your kids to Morocco? After seeing all the family resorts in Morocco there are I’m convinced that a holiday here is for us. All of the preparation and precautions we would normally take travelling with kids are no different for going to Morocco than any where else I would take my children to be honest. A little extra care is needed around hygiene and some additional respect to local customs but there is nothing I have discovered about visiting Morocco that has put me off going there. Our ideal experience of visiting Morocco with kids would allow us to enjoy the country and experience the culture with an opportunity to relax with the family as well . Given that it’s a hot location and children do need some down time, even on holiday, I think Morocco lends itself very well to mixing some sight seeing and enjoying the local culture with splashing around on the beach and playing in the pool. I’m ready to book, how about you? Did you find this post about travelling to Morocco with kids helpful? It would make our day if you would share it with your friends and followers. Great tips for traveling with kids anywhere! And Morocco is a lovely place to spend a vacation! Interesting article. Would love to go there and Tunisia but put it off each year.